Living far from my roots, I have become the queen of armchair genealogy. I was very happy to find a copy of McAlpine's 1870-71 online, with each original page scanned so we can see them. The project was a group effort that resulted in the Our Roots: Canada's Local Histories Online website. The site is slow, but it has entire books online that you might be hard-pressed to find anywhere else. 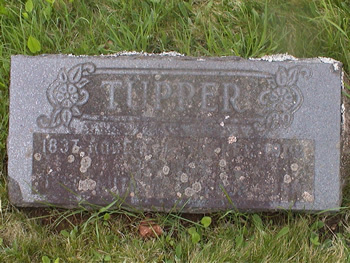 Bertha Evelyn Tupper was born on 19 Feb 1882 in Middle Stewiacke, Colchester County, Nova Scotia, Canada. Unlike both of her parents, Bertha could hear, and she and her brother Erlon must have done a lot of translating as they grew up. She grew up in Middle Stewiacke, and was attending school there by 17 May 1891. She was still living there at the time of her marriage. In later years, Bertha wrote that William Conroy "boarded at the house which he afterwards owned...where he met Bertha Tupper, and was married to her the following year." Bertha Evelyn Tupper and William Daniel Conroy were married on 28 Apr 1899 in Truro, Hants County,Nova Scotia. An announcement was printed the next day in the Truro Daily News: “MARRIED - CONROY - TUPPER - At Truro, on April 28th by Pastor H. F. Adams William Conroy, to Bertha Tupper both of Middle Stewiacke.” They lived with Bertha’s parents for a little while until they could afford a house of their own. The two went on to have thirteen children of their own, plus they adopted Joseph Lyons, who was a relative of William’s. In later years, Bertha writes, "The Conroys had 13 children. Three of them died when quite young…Andrew, May, and Vivian." Bertha went on to list their other ten children: Winnifred, Pearl, Frank, Ella, Evelyn, John, Alyce, Dorothy, Gerald, and Donald. I think she listed them in birth order (other than the three that died young). Throughout her adult life, Bertha was very active in her community. She was a member of the United Church Women and a life member of the Womans Institute of Nova Scotia. She was also very active in her church and was a member of the choir. She is remembered as being very kind and very smart; she was sharp as a tack until the end. I also remember her as being very deaf, but I was pretty young when she died. I also think she must have been very sentimental; it is thanks to Bertha that I have so many family photos and letters (thank you great-grandma). Bertha spent her last few years at the Birches Rest Home in Musquodoboit Harbour, Halifax County, where she died on 21 Dec 1980. The funeral was held two days later, but she wasn’t buried for a while. According to her obituary, Bertha had a "spring burial." Instead, Bertha went to the Mattatall Funeral Home in Truro. 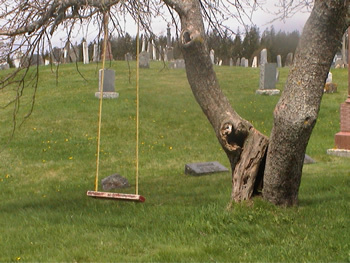 She was buried Spring of 1981 in the new Middle Stewiacke Cemetery. William Daniel Conroy (son of Michael Conroy and Bridget Lyons) was born on 20 Jun 1876 in Lower Stewiacke, Colchester County, Nova Scotia (see picture). He was Canadian, but his maternal grandparents were born in Ireland. William’s mother died when he was only six months old. Leaving William with Bridget’s parents, William’s father went to the States and remarried, settling in Rumford Falls, Maine, although in his later years he did come back for visits quite often. William eventually had four step-siblings by his father: Michael, Thomas, Eva, and Alice. As a young man, William worked at a pottery operated by a man named Joyce in Stewiacke, Colchester County, Nova Scotia. He then headed to the United States to look for work, spending a few years around Boston. By about 1897 he was an employee at a rubber factory down there. But by 1898 he was back in Colchester County, living in Middle Stewiacke. He found a job at a saw mill in Middle Stewiacke, Colchester County. 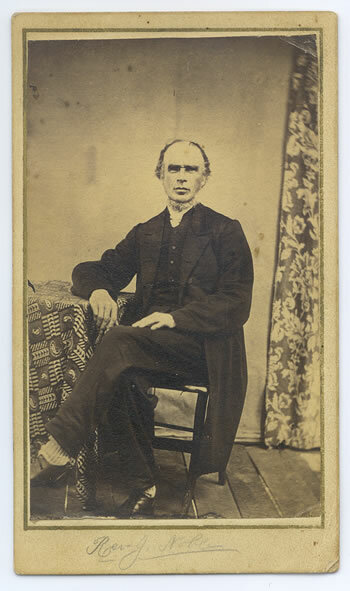 In later years, his wife wrote that William "worked for Joe Taylor of Wittenberg who operated a portable saw mill. Taylor brought his mill to Middle Stewiacke to saw logs that the farmers had joined in piling together in one place, which was beside the road in front of where Alden Kennedy now lives." 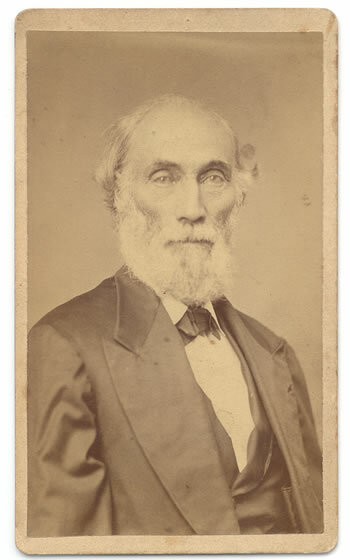 Although he had a brief stint at farming around 1901, soon William began what was to be a 32-year career in the lumber industry, working for the Canadian Lumber Co. in Stewiacke. He was what was called a “scaler.” His grandson explained that William's job at the lumber mill was estimating how much logs were worth so that the farmers could be paid. It was a difficult job, because you had to be able to see how many boards could be made from a particular log and sometimes people would try to cheat. William got quite good at it, and could look at logs very quickly and give a fair price. According to my Dad, William had red hair. He wasn't tall, but he was powerfully built with broad shoulders. Since both of my father's grandfathers had jobs in Boston, when the two men met, they liked to reminisce about the places they knew there. William bought a car once (before a person needed a driver's licence) and kept it parked in the barn. One time when he went out to drive the car, he got confused and drove right through the back wall of the barn. He never drove again (after that he stuck with his horse, Billy). He died in Feb 1963 or Mar 1963. My father remembers that his grandfather Conroy died in late winter. 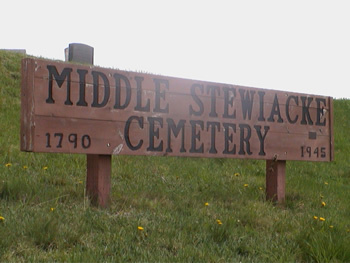 He was buried in the new Middle Stewiacke Cemetery. Joseph Lyons (born on 10 Sep 1892). Winnifred Conroy (born on 14 Sep 1899). 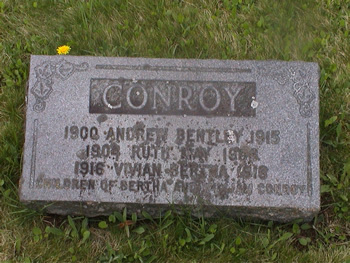 Andrew Bentley Conroy (born on 30 Dec 1900). Pearle Conroy (born about 1902). Ruth May Conroy (born in 1904). Frank Conroy (born about 1906). Ella Conroy (born on 16 Feb 1908). Evelyn Lillian Conroy (born in 1909/10). John L. Conroy (born about 1912). Alyce Greta Conroy (born on 2 Apr 1914). Vivian Bertha Conroy (born in 1916). Robert Fitzgerald "Gerald" Conroy (born on 14 Apr 1921). 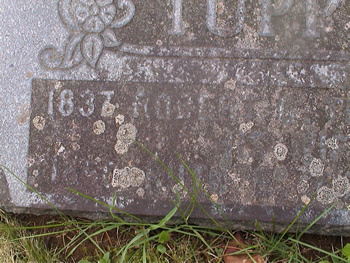 Next to the Tupper Monument in Old Middle Stewiacke Cemetery, is a small, flat stone dedicated to Robert G. Tupper and Ruth Elizabeth Bentley. Because it is flat, it is quite worn and difficult to read. I took some close-up pictures, but see for yourself if they help at all. 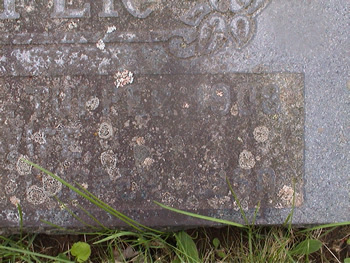 This marker is identical in style to a marker next to it that documents the lives of three Conory children (Bertha Evelyn Tupper Conroy was the daughter of Robert and Lizzie).